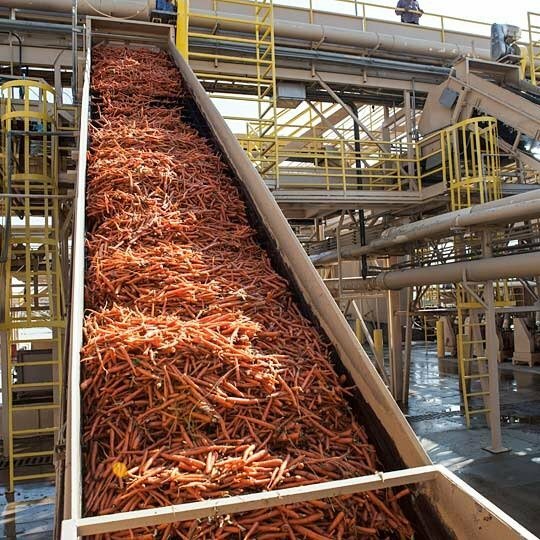 Have you ever wondered where baby carrots come from? These bite-sized crunchers have experienced a pretty incredible journey by the time they wind up in our lunch boxes and snack trays. I recently got the carrot's-eye view of this whole process during Grimmway Farms' fall carrot harvest. 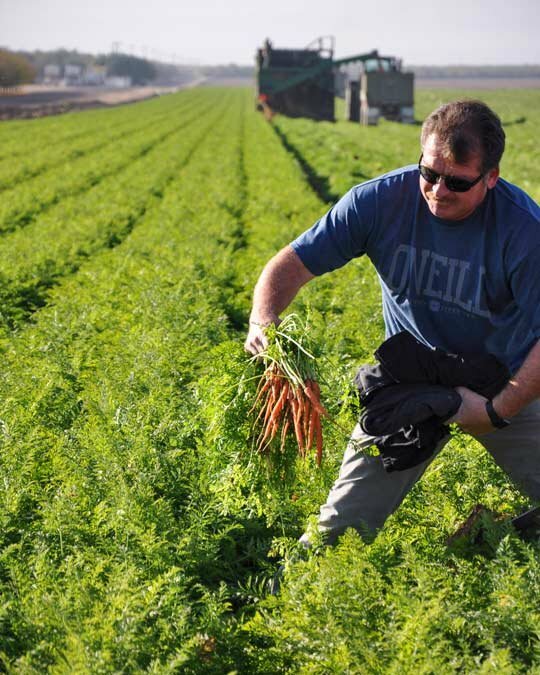 It all starts with a big field, rows upon rows of green-topped carrots, and the hot California sun. Baby carrots start off life as actual, honest-to-goodness, full-sized carrots -- although they are usually picked while still young for best sweetness and texture. These carrots are planted closely together to encourage them to grow straight down into the earth and develop a uniform width. This makes it easier and less wasteful to cut them to baby carrot-size later on. The harvester mimics what would otherwise be done by hand: a pincher grabs the tops of the carrots while a shovel-like tool loosens the earth under the carrots. In one motion, they are scooped from the ground and carried up onto the harvester. The front wheel keeps the harvester aligned on each row. 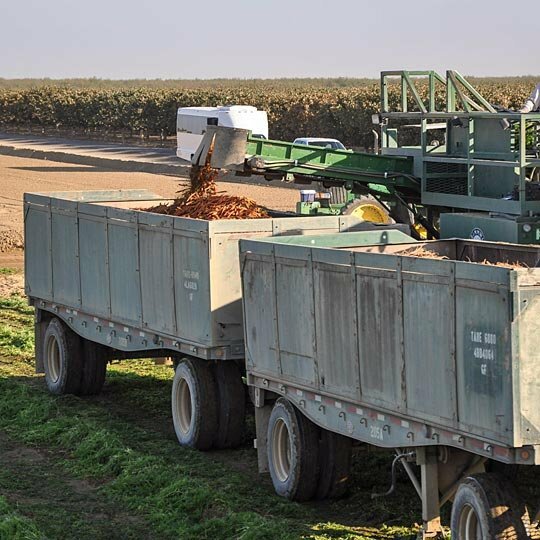 Once carried onto the harvester, the carrot tops are snapped off and the carrots themselves are transferred into the waiting truck bed. The tops are discarded behind the harvester, where they are either turned back into the soil for mulch or gathered to be used as cattle feed. Once a truck is full, it drives back to the processing facility. 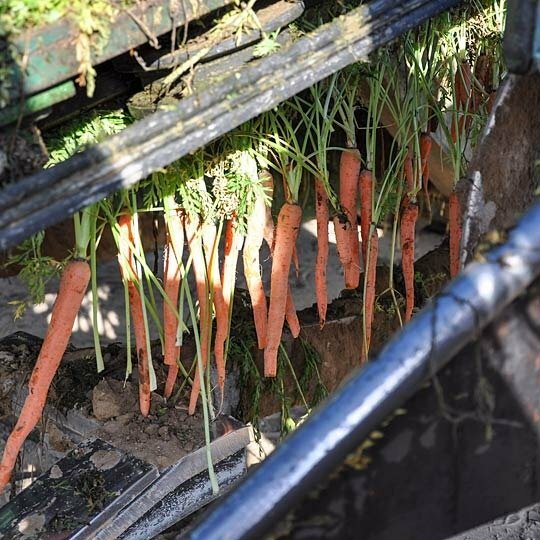 The carrots are washed out of the truck with hoses and carried into the facility in water luges. The luges are for more than just transport: the buoyant carrots are carried along on top of the water while dirt and rocks sink the bottom. A small amount of chlorine in the water (4 ppm, about the same as most tap water) helps to sanitize the carrots and ensures food safety. The water is recycled several times through the facility before ultimately going back to water the crops. 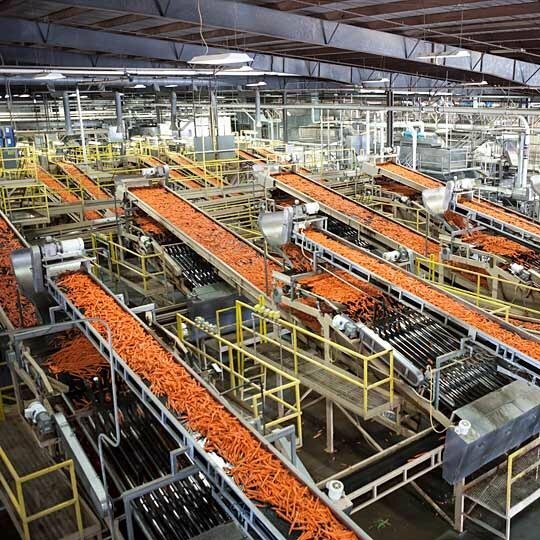 In the facility, the carrots are sorted according to size and cut into two-inch pieces. They are then stored for one to five days before final processing. 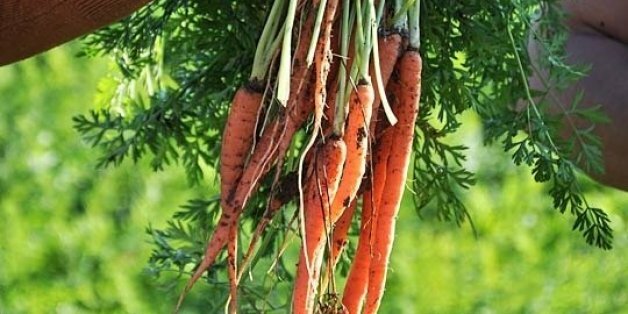 Carrots actually respire and generate heat after they've been harvested and cut; this storing time gives them a chance to settle down before they're packaged. 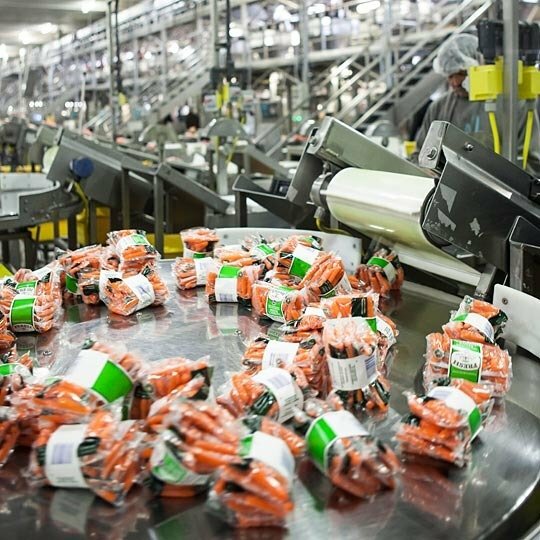 It also allows the farm to harvest and package the carrots in two separate steps, allowing for continuous packaging during both peak season and slower moments. Finally, the carrots are peeled and polished into their signature baby carrot size and shape. The carrots are sent spinning down a spiral slide with a grated surface (much like a microplane). As the carrots tumble and turn, the peel is rubbed away and the edges rounded. The pulp created during this process either goes back to compost the soil or to cattle feed. The baby carrots are sorted again by size, and then packaged into bags for delivery to the store. 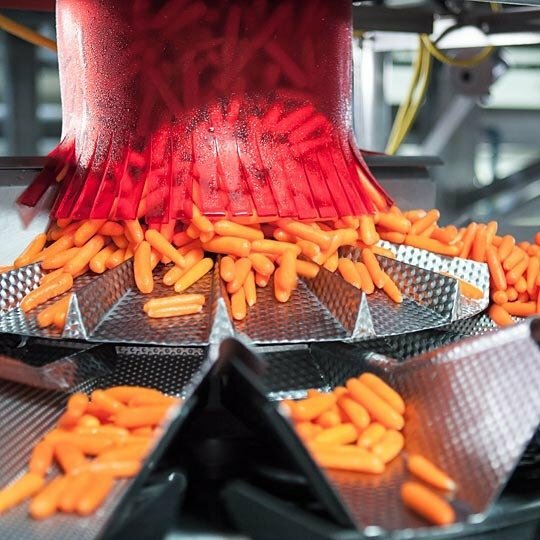 Microscopic perforations in the packaging allow the carrots to continue to respire and releases the CO2; since many spoilage-causing bacteria thrive in a CO2-rich environment, allowing the CO2 to escape improves the carrots' shelf life. There you have it! Baby carrots are pulled from the field as long and skinny carrots, and get whittled down, step by step, into their snack-worthy final form. Do you love baby carrots? What do you do with them? 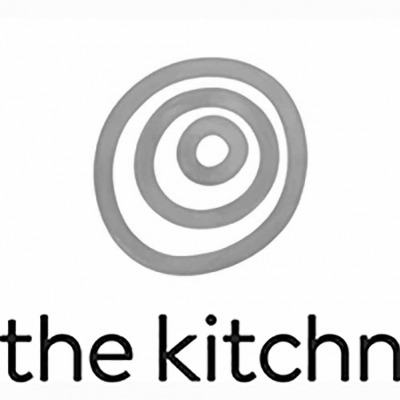 This article originally appeared on The Kitchn. 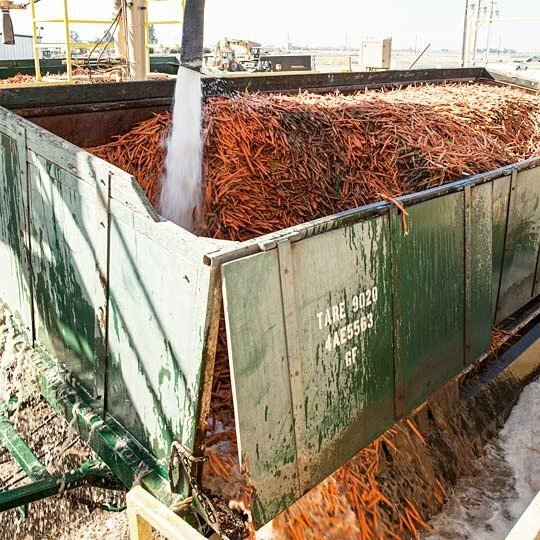 All images of the carrot harvest by Emma Christensen; images inside the processing facility courtesy of Grimmway Farms.